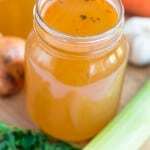 Homemade vegetable stock – The must have culinary essential homemade tool to enhance your soup, stews and other delicious cuisines. The summer season is associated with cook outs, salads, smoothies and lots of tropical treats. Well the irony is I’ve been eating soup more so than ever, actually the catalyst for this bizarre behaviour was when I developed a summer cold towards the beginning of July. At the time I created various types of soup to remedy the flu. That soup cycle has continued since then and I have no intention of stopping, so forgive me for being so ahead of climate schedule. Soup is a heart warming comfort food we love the taste and texture of broth. The question is what makes soup taste so good? What are the components, if any? 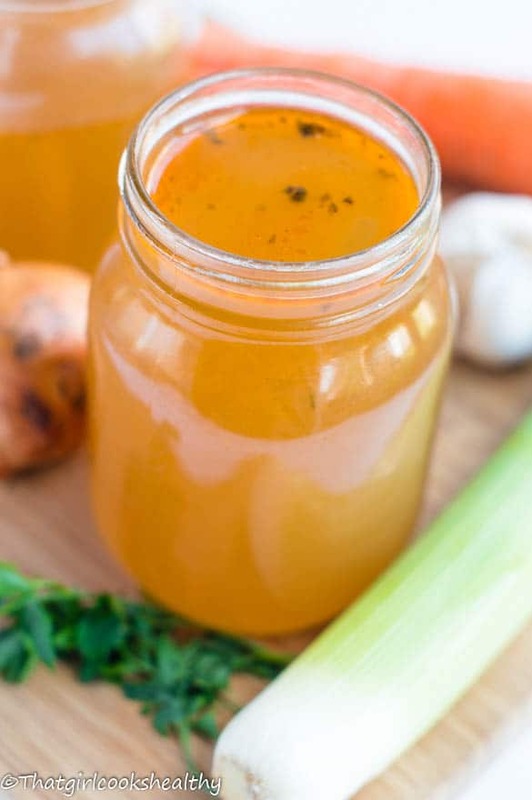 One of the key foundations to making deliciously tasting soup is homemade vegetable stock. Stock is basically a thin liquid made from simmering a selection of raw produce for an extended amount of time. There are various types of stock; beef, fish, chicken, lamb, prawn etc.. However I’m going to be exploring some vegetable stock made from scratch. Once you taste homemade stock you will never consider purchasing the commercial kind again (p.s you were warned, taste buds will be appeased). Speaking of manufactured stock, what really annoys about store brought kind is the additives and preservatives. Usually they are added to enhance the “flavour”, increase shelf life, bind ingredients or to add colour. These are just a few of the common reasons, so keep that in mind. The picture on the right is an image taken of the posterior side of Knorr stock cubes. 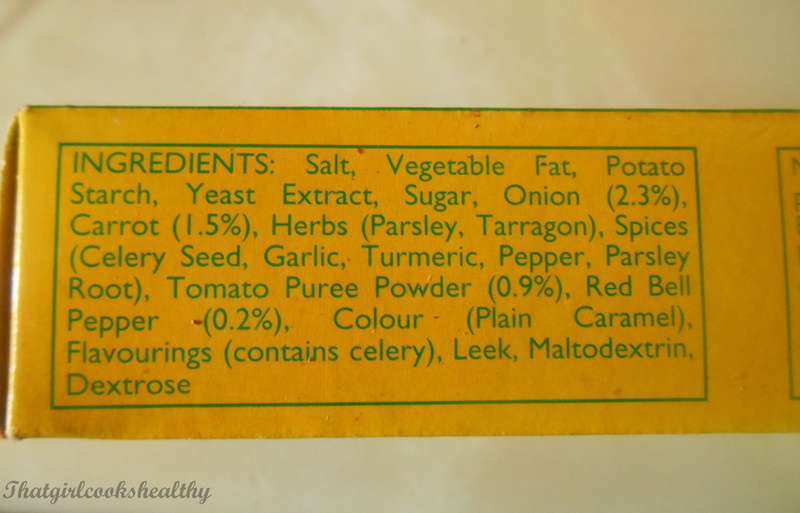 As you can see from the picture these stock cubes are laden will unnecessary fillers like; refined salt, various types of sugar (maltodextrin, dextrose) flavouring and colour. All these ingredients are extras which attributed to things such as weight gain, diabetes, water retention and other vascular problems. These horrid additions are exactly the reason I shun stock cubes because they are adulterated and disrupt the body’s hormones pattern. Homemade vegetable stock is not only healthier but also fun. You can be as inventive as you as wish. There are recipes that even call for the leftovers and scraps of veggies to be included. Nothing goes to waste here!! The basic ingredients for stock tend to be; carrots, onions, parsley, celery, garlic, and other herbs and spices like salt, black pepper, thyme. Its also not unusual to find turnips, leek, ginger, tomato, mushrooms and even tomatoes in veggie stock. I had an unbelievable time in the kitchen doing some trial and error with veggies to find ones complimented each other. I used mushrooms , red onions (personal preference), carrots, garlic, leek, celery, thyme, himalayan pink salt, parsley, thyme, bay leaves and chopped tomatoes for a reddish/brown hue. Mushrooms hold moisture, so opt for dried mushrooms. That’s quite alright if you don’t have any at hand, simply dry fry them for 1 -2 to evaporate some of the moisture first of all. Cutting the veggies up is pretty simple, because we need the vegetables to extract their flavours, therefore there is no need to be meticulous with cutting. Roughly cut them into segments. Another important step is to caramelise the veggies, don’t skip this step, this is crucial for imparting those wonderful flavours which form as part of the stock. In terms of simmering, anything between 1 and 30 minutes to 2 hours. Anything longer will ironically cause the flavour to diminish, so do be mindful of the beginning and ending stage. Once the stock has simmered for an extensive amount of time, you will notice the vegetables become dark and soft appearance. The majority of the flavours will have already been extracted, so next it is time to squeeze out the excess liquid. Leave the pot to cool down, as it’s best to do this by hand with a strainer or cheese cloth. When cool give the cloth a generous squeeze until all the liquid has been drained, then simply discard the mushy veggies. How much vegetable stock does the recipe make? 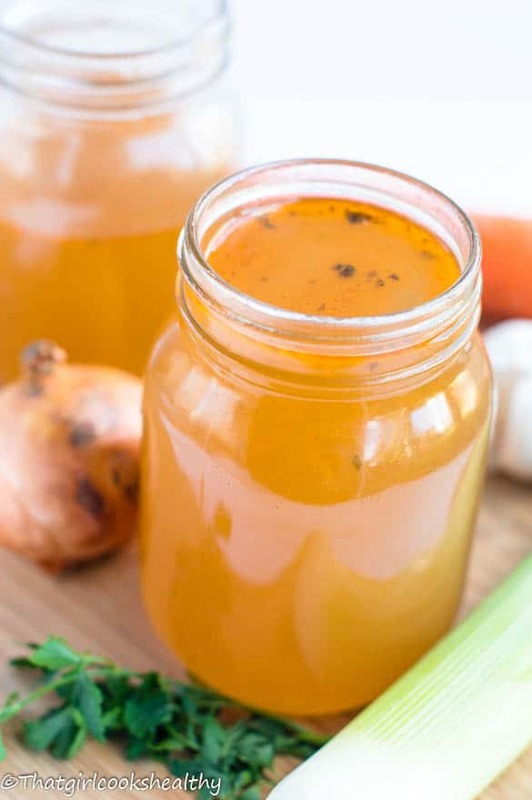 The homemade vegetable stock recipe creates roughly three jars of stock. How to store homemade vegetable stock and how long does it last? Vegetable stock should last for 7 days in the refrigerator. I sometimes freeze the excess stock as giant ice cubes and use as I go along. This ensure an even longer life span for the the stock. First of all if you’re using mushrooms that are not already dried, dry fry (meaning fry without oil) under low heat until the moisture is removed. If you are using dried mushrooms, you can skip this step. Add the mushrooms to1 pint of hot water and set aside. Now it’s time to preheat the stock top with the olive oil on medium heat. 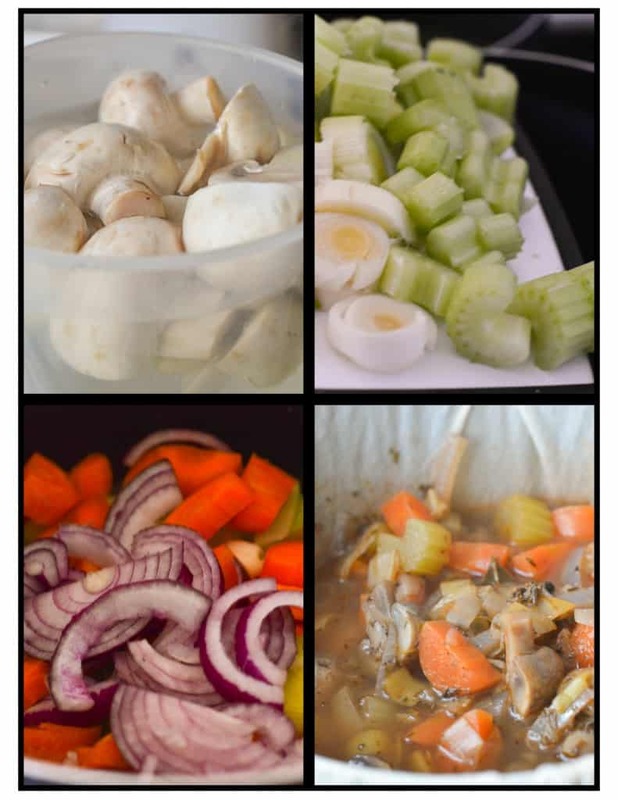 Once heated add all of the cut up veggies to the preheated pot and began to sautee until a brown hue is present. Given that there are so many vegetables in the pot this may take several times. Once tanned, add the chopped tomato and continue to sautee on low heat for another 2 minutes. Incorporate the outstanding herbs, spices and mushrooms with water, stirring all the while. By now the vegetable medley should have taken on a wonderful aromatic smell. Finally add the remaining 3 pints of water, add enough so that the veggies are completely saturated in water. Feel free to add half a pint more if required. Leave the pot to simmer under low heat for 1hr 30minutes – 2 hours maximum. Remove pot from the stove and leave to cool down. Once cool, pour the mixture into a straining device, a cheesecloth or strain will suffice. If using a cheesecloth use your hands to strain out the excess liquid. Can store in refrigerator for roughly a week. Store in ice cube tray to extend shelf life. Ensure to caramelise the veggies for enhanced flavour. 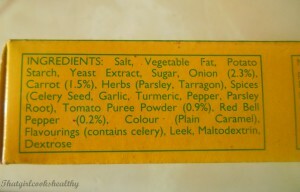 Feel free to add additional vegetables which were cited in the post. I too hate ingesting all those addititives and preservatives on store-bought packaged foods. I’ve dabbled with making veggie stocks before, but never really stumbled upon anything great, so thanks for such an informative write up – especially those cooking times! It’s a shame the veggies themselves go to waste at the end of it – any ideas about how you could possibly re-use the solids at the end of it? I hate to throw away anything! Thank you! Good question, as most of the texture and nutrition will have gone from such a lengthy time of simmering, you could perhaps use the leftovers as compost or puree the leftovers and have it as a side serving. I will try this myself and see how it works. Agreed, I’ve managed to ween my grandmother off those packet soups and her blood pressure has gone down immensely. I would highly suggest encouraging your grandmother to ditch the pack soups and make the foundation of the soup with freshly made stock. It’s a bit different from how Caribbean people usually make it but it’s also a lot more healthier.